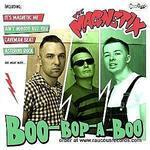 The Magnetix caused quite a stir with their debut album, with the Russian trio proving to be ones of the best Old School style Psychobilly bands on the scene. Their second album Bop Bop A Boo turns out to the even better than the first. Packed with original stompers, with a couple of great cover songs featured too. Certainly one of the most exciting new bands in the world of Psychobilly.